Another gem of a find from Numero Group. This time it is a collection of lost recordings from Pieces lead singer Linda Bruner. These songs are at once immediate and striking. We discovered this record on one of our favorite sites, that has to remain a mystery (no, we're not kidding), but thanks to Jakob for his write up after the jump. A collection of songs representing the last known recordings of Pisces lead singer Linda Bruner, Songs For A Friend hint at a remarkable solo talent that was never quite realised or revealed to the world at large. With the understated accompaniment of Pisces guitarist Jim Krein, Bruner lays down six songs – all but one of which are covers – committed to tape under the most ad hoc conditions at Nielson’s Music Store around 1970. The recordings are unrehearsed and strikingly unconditioned, capturing performances that are visceral to say the least. 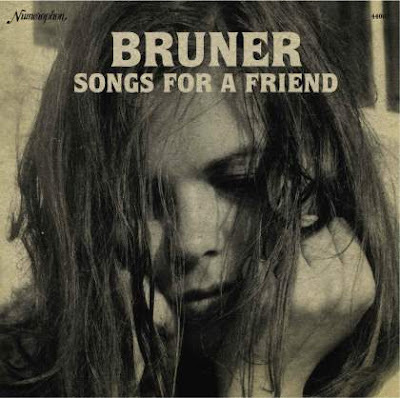 Bruner’s voice is an incredibly dynamic instrument, at times dwelling in a mumbled, very intimate tone, yet on a cover of the Beatles’ ‘Don’t Let Me Down’ she really opens up the pipes for a rousing performance that transcends the lo-fi recording circumstances. Possibly even more wonderful is a rendition of the Jimmy Webb / Glenn Campbell classic ‘Wichita Lineman’, but perhaps the most telling contribution of all is her own composition, presented under the most perfunctory of titles: ‘Song Linda Wrote Herself’. This document really underlines the power of Bruner’s vocal, beginning with a short between-takes exchange with the engineer before her voice changes completely when she shifts gear into singing mode. If you’ve previously been won over by rediscovered artists like Karen Dalton, you’ll certainly want to hear Linda Bruner. The album only runs for twenty minutes, allowing the 150g vinyl room for an etching on one side, something that only adds to the overall opulence of this fine Numero edition.